You’ve probably heard the statistics. Fewer people in the U.S. are identifying as Christian. Fewer people are attending church. Fewer people think religion is important. Maybe you’ve seen these trends in your own community. They’re sobering, but they also point to a wealth of opportunities to witness–in the U.S., in Kansas, in our local communities and in our own families. We all share the vocation of “Christian witness.” We may not all be called to proclaim from a pulpit, but we can share the story of Jesus’ death and resurrection with others. The resources here can help make that job a little easier. 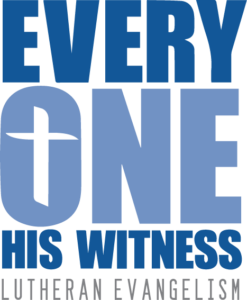 Every One His Witness focuses on individual evangelism in everyday life, using a systematic, action-oriented model to equip Christians to be active and effective witnesses for Christ. Need help acquiring materials? Grant support is now available from the District for congregations, schools, and organizations interested in acquiring Every One His Witness materials. The grant process is simple; just download and complete the form below, and send it to Janet Powell in Missions and Stewardship.